Downtown Branson offers several different venues for you to choose from when you visit Branson so you will be close to all the great shopping and eating in the area. Be prepared for a dazzling and luxurious night’s stay in one of Branson’s top hotels at the Hilton Branson Convention Center Hotel. Stay in one of their guest rooms that offer one king “The Serenity” bed or two queen “The Serenity” beds, along with a 37” LCD flat panel HD television, and much more! Enjoy a beautiful view of Lake Taneycomo, the Branson Landing, Historic Downtown Branson, and the Ozark Mountains. Whether it’s business or a family vacation, you are sure to enjoy all their various amenities and services for your needs. Relax in one of the Promenade’s Deluxe Guest Rooms or their Branson Suites and Condos. You will enjoy their luxurious king and queen beds from the Hilton Serenity Collection, their 32” flat screen TVs as well as internet and other amenities. Find out more about their specials and packages such as their Bed & Breakfast Deal, The Branson Tracks and Ferris Wheel Package, and more at hiltonsofbranson.com. As an award winning hotel in Downtown Branson, you won’t be disappointed with this Choice Hotel. Conveniently located near the famous Highway 76, the Best Western Plus provides you with not only a short distance to all the great shopping and restaurants Downtown, but also to one of Downtown Branson’s free trolley stops right outside their lobby. Refresh yourself with their free hot breakfast each morning, or take a swim in their indoor pool. You will also feel rested in any one of their standard rooms or suites. If you enjoy staying in an historic location, then you will love Landmark Inn. Originally built for the railroad's station master in 1905, it later became a boarding house. If you are looking for a quiet location close enough to the shopping and eating in the Downtown and the Landing, then this is the place to be! The Landmark Inn is known for its quaint location and clean rooms. The hotel has a total of 8 rooms that consists of Queen Deluxe rooms, 2 Full Bed Deluxe rooms, and King Deluxe rooms. They also provide a plethora of room amenities that will keep you comfortable during your stay. A hotel that’s connected to a café and wine bar is always a good choice if you are looking for something extra to add to your stay. 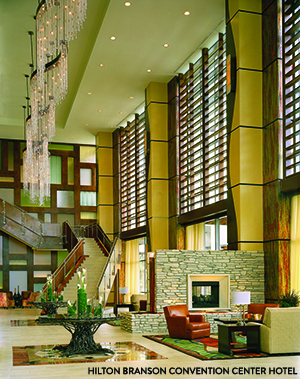 The Branson Hotel offers some of the most unique rooms you will find during your stay. The hotel contains 2 floors filled with rooms containing different themes. Try the rustic look of their Horseshoe bedroom that will fill your heart with country. If you are going for more of an early 1900’s look, then you will love their Heritage room. You won’t want to miss this gem in the heart of Branson. Stay in a place where you know it feels just like home. 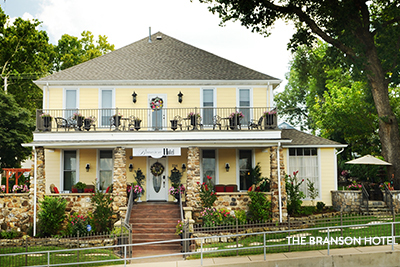 At the Branson House Bed & Breakfast, you will find the perfect location for a quiet or romantic getaway. With their continental breakfast, luxuriously appointed rooms, and private baths you’ll find yourself wanting to come back again and again. During your stay, the Branson House Bed & Breakfast would like you to see it as more than just a vacation but making a memory. Do you like to be able to park in front of your door or just be steps away from your room? 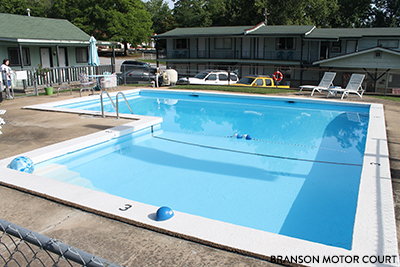 Branson Motor Court is a quaint and clean motel that is perfect for your traveling needs. You can relax in their renovated rooms and enjoy their well-manicured surroundings. Their free Wi-Fi, outdoor pool and wonderful bedrooms will give you the peace and calm you need from a long journey. You can find out more information on their website at bransonmotorcourt.com. With Downtown Branson’s variety of lodging, you’ll be glad you chose the heart of Branson during your stay.